Silly Genius studies the way property is used to establish local identity with a quiet amusement easily mistaken for carelessness. For years he knocked on gatekeepers’ doors for support in painting benches at bus stops, or putting up small murals in corridors and bridges, he says he was met with either inconclusive answers or overt rejection. While he was excited by the art scene that was developing in the city, the tension grew as he kept going back home to a side of town untouched by the numerous revitalization efforts. There were big annual art festivals, but they overlooked most local artists. As time went on, Silly’s calls to property owners went from simple inquiries to a developed pitch for the All City Art Club, an initiative started in July 2017 to animate the Southside with murals. With specific attention to the 22 blocks between Southside Plaza and the intersection at Jefferson Davis Highway, Silly Genius and his friend P.T. Carroll want to place large-scale murals around the area with the hope of attracting business owners and foot traffic along Hull Street. In 2012, Shane Pomajambo was working on the third G40 Art Summit, to be held in Washington D.C., when he got a phone call from RVA Magazine founder Anthony Harris. Knowing the work Pomajambo had done with his gallery, Art Whino, Harris sought to usher in Richmond’s arts district with Pomajambo’s proven skill for creative placemaking. Two hours north in Alexandria, Virginia, Pomojambo’s three-story gallery is a kind of alternate universe, the muralized walls enveloping visitors into another world. “I opened it in order to be able to change the art scene in the D.C. metro area,” he said, “and one of the things I did in order to make that change in the art scene is to do big events, so the G40 Art Summit was one of those events.” With the Art Whino gallery as the summit’s nucleus, Pomajambo brought more than 35,000 people to D.C. and then to Crystal City, Virginia for exhibitions of more than 5,000 pieces of art. The summit showcased customized collectibles, skateboard and mural art, stencils, and 3D installations from internationally renowned artists, muscling D.C. and Crystal City respectively towards the distinction of arts destinations. In the area soon to be declared an arts district, near Virginia Commonwealth University, there was already a strip of galleries, thrift stores, and eclectic shops. On the first Friday of each month, a few hours before sunset, galleries open their doors to residents for an art walk. People play drums on the streets, youth slam teams raise money spitting poems on corners, and choirs bring keyboards and sing to children dancing in front of their speakers. Pomajambo used the monthly art walk as a launching point for the summit. He secured six storefronts throughout the arts district for group exhibits, and 10 city walls for the murals. Standing in the middle of Broad Street amid Rapid Transit construction, on either side are just a few of the galleries that comprise the district. Photo credit to Francis Stephens. Brazilian artist Joao Lelo had participated in the first G40 in Washington, D.C. and was excited when Shane invited him to participate in the Richmond summit. At the time, he says, murals were new in Brazil as graffiti itself had only recently become popular in the late ‘90s and early aughts. Pomajambo’s goal was to establish Richmond as an arts destination by giving it one of—if not the—highest concentrations of murals in the United States. 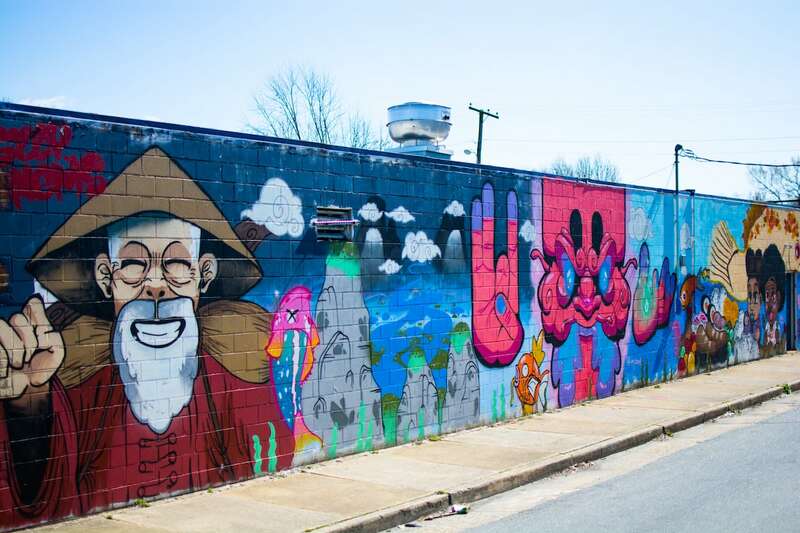 Business owners’ desire for feet in the street encouraged him to expand the project beyond a one-time summit into a five-year project with the goal of painting 100 murals in the city. Once the summit was underway, investors quickly matched his excitement, making the 12 international artists of the summit the first cohort of the ongoing project and more than doubling the slated 10 murals to 22 within the month. All City Art Club’s cold calls and door-to-door pitches yielded few results until recently. “He was the first person to say yes. He said ‘it’s a fish market, so just put some fish in it,’ so we kind of took what we were already going to do and just twisted it to fit the theme,” Silly says. While Pak owned a technology shop, he loved fishing and helping out at his sister’s fish market on the weekends. After he gave up his tech store, he bought the fish market from his sister in early 2001, and he employed four people for just a few months before business started to decline. Now during the day, often the only activity is between his playing grandchildren. The customer base is overwhelmingly neighbors, people whose families have long bought their fresh trout from the silicone coolers and talked to Pak, affectionately called Papa, while it fried. Rarely do people come across the bridge from downtown seeking him out. Despite saying yes to the All City Art Club, Pak is not confident murals will increase foot traffic or business down Hull Street. “People see the wall and think, ‘oh, very nice.’ Nothing else,” he insists. “I bought this building so I have no choice." But what Silly sees in that advertising is something else: A development that will likely shut out the people who made the Southside what it is. We also wasn’t really allowed to be mad about the death of King or what we had seen in that museum. The Museum—the motel where King was assassinated—now is the Black hole around which this constellation of white economies of new Memphis thrives.